A while ago I watched a television programme which made some reference to King George III. All the traditional accusations were there: the mad king, the king who was extremely stupid, the king who tried to undermine Parliamentary government and rule by royal autocracy, the king who intrigued to get rid of the popular Whig ministers and replaced them by Tories who would carry out his wishes and who came to be known as the "King's Friends" party, who undermined public liberty and succeeded only in driving America to revolt. Much of this traditional account has focused on the malign influence of Lord Bute, a Scottish nobleman who was George's intimate adviser, and is supposed to have directed the King on his course of unconstitutional behaviour. It was disappointing to hear all this repeated in a modern broadcast, because not only are these charges myths, but myths which have been discredited a long time ago. It is over 80 years since Lewis Namier published his ground-breaking books, "The Structure of Politics at the Accession of George III", and "England in the Age of the American Revolution" (which, confusingly, is actually about politics in the early 1760s), 70 years since Romney Sedgwick edited the young George's letters to Lord Bute, and 40 years since John Brooke's magisterial biography of the king: yet the fact that these books comprehensively demolished most of the myths about George III has still had no effect on popular awareness. I myself was privileged to study this particular topic under Herbert Butterfield, one of the greatest historians of his generation. Also on the course was an extremely impressive fellow-student who duly became a professor himself: John Brewer. In this essay I shall outline George's relationship with Bute before George became King: a later essay will outline what actually happened in the early years of George III's reign. Following Frederick's death, young George was largely ignored by his grandfather. The governor appointed to supervise his education was Lord Harcourt, succeeded in 1752 by Lord Waldegrave (whom George later described as “a depraved, worthless man”), but from 1755 the most important person in his life was John Stuart, Earl of Bute, who quickly filled the place of the father-figure the young prince needed. He was 25 years older than George, a nephew of the Duke of Argyll, educated at Eton. From 1757 Bute was always addressed as “my dearest friend” in George’s letters. George wrote to him almost every day: letters full of complaints about the King and the government, and of plans for what they would do together when George succeeded to the crown. Contemporaries could not understand the extraordinary hold that Bute established over George, and assumed that Bute must be having a love affair with Princess Augusta, his mother. This gave rise to many highly libellous cartoons and poems from Bute's enemies, but historians have yet to find any evidence of the truth of such allegations. John Brooke’s biography shows that it is a myth that George was a stupid, retarded boy. Documents preserved in the royal archives demonstate that he was able to write a tolerable letter by the age of 8, and could write in German by 11. He came to know more French and Latin than a boy of his age nowadays might be expected to attain, and he was also taught some mathematics and science. Booke’s verdict is that George received a much wider education than he would have had at the time at Eton and Oxford University. Like the rest of his family, he loved music, and enjoyed playing the flute and harpsichord. In many ways Bute was an excellent tutor. He was a cultivated man, and it was thanks to him and the earlier tutors that George developed his lifelong interest in such diverse subjects as botany, experimental farming, book-collecting and astronomy. He got George to write very long essays on British constitutional history, many of which survive, and which show interpretations of history that were standard at the time. George criticized James II’s attempt at “arbitrary power”, admired William III and Alfred the Great, and even praised Cromwell as “a friend of justice and virtue”. He was suspicious of a professional standing army, as being a potential threat to liberty, preferring a citizens’ militia: a matter to be taken up by the Americans a few decades later. What Bute could not teach him was the practicalities of how to rule Britain, because Bute had no experience of government, and very little of politics beyond a few opposition slogans. But George believed these slogans. He was a shy, lonely boy, allowed few friends of his own age, lacking in self-confidence and painfully aware of his own inadequacies, but at the same time driven by strong moral principles; and believing that Bute was the only man on whom he could rely. This was to cause a great deal of trouble at the start of his reign. To put this into context we must outline the political situation in the 1750s. English politics had long been contested between two parties, the Whigs and the Tories, but by the end of George II’s reign both parties had greatly decayed. Traditionally the Whigs had been the party of the Hanoverian Protestant succession, whereas the Tories were tainted with Jacobitism: loyalty to the deposed Stuarts, and to the “Pretenders”, father and son, James and Charles ("Bonnie Prince Charlie"), who were Catholics and, furthermore, backed by the French. There had been unsuccessful Jacobite risings in 1715 and 1745 (see my earlier essays on Jacobitism for more on this subject). Other controversies had stemmed from this: the Hanoverians were Germans, and Tories accused them on subordinating British interests to those of Hanover. 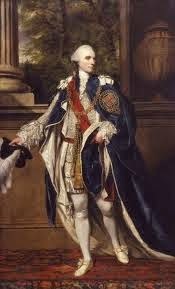 The Jacobite threat had tied the Whigs and the first two Georges together: Whig governments had been in power continuously since 1714 and the Kings dared not admit Tories to the cabinet or to the court. The Whig monopoly of power naturally led to accusations of corruption, which were fully justified. But by the 1750s the Jacobite cause was dead, and the Tory party had ceased to exist as an organised entity. But with no enemy in the field, the Whigs had also disintegrated into squabbling factions, and politics had become a mere struggle for personal power, with no ideological issues involved. Ever since the death of the Prime Minister Henry Pelham in 1754, the Whigs had lacked an adequate leader in Parliament. Pelham’s brother, the Duke of Newcastle, succeeded him in the Premiership, but he was ineffective and generally regarded as a figure of fun. The two dominating personalities in the House of Commons were Henry Fox and William Pitt, but both had defects. Fox was an able administrator, but was disliked and mistrusted as a corrupt and ruthless operator. Pitt was greatly admired as a magnificent, visionary orator and an honest politician, but he was essentially a maverick. He was in poor physical health, mentally unstable (at crucial periods he was immobilized for months at a time by severe depression), and was never interested in the day-to-day details of political management. There was an important and unusual complicating factor. The mutual hatred which prevailed between each Hanoverian King and his heir meant that the Prince of Wales often acted as leader of the opposition to the government. At his London home, Leicester House, the Prince would act as host and sponsor to opposition politicians, and they would plot to cause trouble. Since these were inevitably a disparate bunch, the propaganda they put out was cliché-ridden even at the time, and can still be widely heard nowadays – that ministers were corrupt and self-seeking, that they were leading the country to ruin, and that instead of playing futile political games it would be better if all men of goodwill could bury party differences and get together to provide the nation with better governance. The Latin-derived word, “patriot”, was coined as an ironic name for such men (the opposition has always got to be more “patriotic” than the government). The fact that the Prince of Wales was leading them helped solve the dilemma: how can you oppose the King’s government without automatically committing treason? The Leicester House group could therefore be regarded as the first-ever “loyal opposition”; as distinct from the Jacobites, who were a disloyal and treasonable opposition. Both William Pitt and Lord Bute had been associated with Leicester House. But with the premature death of Prince Frederick, while his son was still a boy, the Leicester House opposition disintegrated and did not reappear until the future George IV came of age. In 1756 Britain was caught by surprise at the outbreak of what became known as the Seven Years’ War with France. It began disastrously, and Newcastle’s government collapsed. After a period of political chaos, the obvious solution emerged, which was a coalition government: Pitt became Secretary of State and director of war strategy, with Newcastle as First Lord of the Treasury, responsible for raising the money and overseeing political management. Even Henry Fox was given a government job (and, typically, made a great deal of money out of it). The only person who was given nothing was Bute, and he resented it. By 1759 the war had brought a series of triumphs in Canada, India and the West Indies, whilst in central Europe Britain’s allies, Frederick the Great of Prussia and Ferdinand of Brunswick, held the armies of France, Austria and Russia at bay. Organised opposition to the government hardly existed. Nevertheless, the young George was taught by Bute to dislike the government. Newcastle was despised as personifying everything that was corrupt about politics, and Pitt was regarded as a traitor for his desertion of Leicester House; to young George he was “that blackest of hearts”. The war, although going well, was vastly expensive and, George and Bute thought, should be brought to an end as soon as possible. By 1758 George’s resolve, as revealed in his letters, was clear: when he became King, he would sack the ministers, put Bute into power, achieve a peace agreement, and then together they would bring about a thorough clean-up of the whole political system. In October 1760 George II died. He was the oldest King that had ever ruled England: the first one ever to pass the age of 70. By contrast his grandson, now George III, was at 23 the youngest monarch to ascend the English throne since Henry VIII more than two centuries earlier. Everyone knew that major changes were likely. My next essay will cover the events of 1760-65.